Skeletal doctors, radiation, near countless weapon customization. Isn’t that why we all got into gaming in the first place? Even if it wasn’t, you have to appreciate what the team at Spooky Ghost Studio are trying to accomplish with Doctor Radio’s Immersive World. This open world side scrolling platformer features the good Doctor Radium Steppohnovich, action scientist, working his way through some pretty slick looking levels. 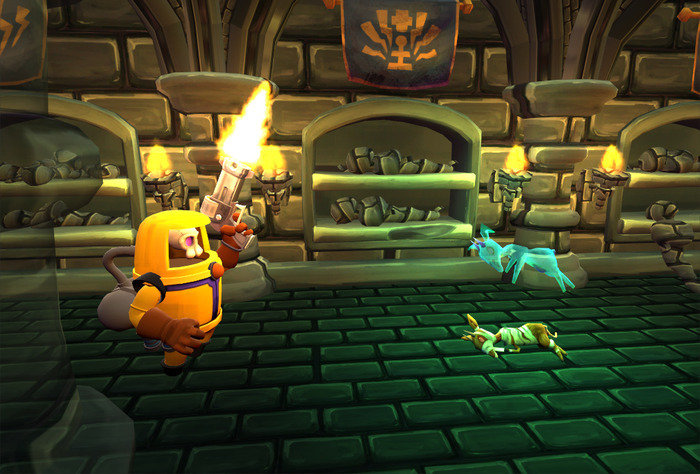 Lacking any special powers, the player must combine various elements found from dead enemies and the environment to create customized weapons. This “Wizard Guntronica” allows you to build “millions of guns”, according to the developers. Sound a little too optimistic to be true? Check out their funding video for yourself and see how passionate this team is. Go for the passion, stay for the retro futuristic techno babble. Operate a massive arsenal of modular weapons, customizable to different play styles. Harness the power of radiation to slay enemies, plot sensitive characters, innocent bystanders or even unlock doors. Collect loot to build weapons with exploding shovels, gravity rays, mods, and AIs for your guns! Achievements reward the player with additional game features like skins, guns, titles, and other fabulous prizes. If you like where things are headed, you can also check out the official website for lots more info, and a great comic. Funding for Doctor Radio’s Immersive World is running until October 9th, with a pledge goal of $250,000.